Team iW is ramping up for BaselWorld 2013, FIVE days and counting! 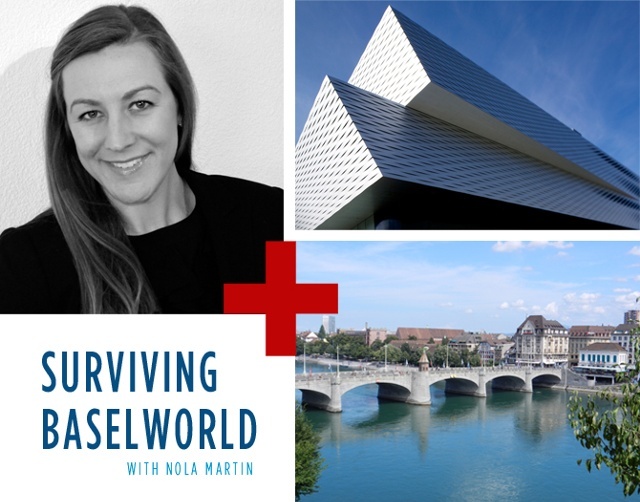 Our resident Swiss Corespondent and Managing Editor Nola Martin has prepared a list of the best eats, hottest spots and tips and tricks to making the most of your BaselWorld experience. St. Alban-Stübli: Enjoy traditional, home-cooked food in the cosy Stübli in the style of the region or in the garden. Afterward, head up the stairs to the tiny cigar room. Walliser Kanne: Enjoy traditional Swiss cuisine of fondue and Raclette or Wiener schnitzel- the restaurant’s specialty. Schlüsselzunft: This is one of the oldest guildhalls in Basel, built in the twelfth century by cloth merchants. The restaurant has a menu with seasonal specialties, including various types of fish and venison. The cooking is careful and the talented kitchen delivers solid flavors using quality ingredients. Stucki: Restaurant Stucki in Basel is a place of great culinary heritage: this is where the Grand Seigneur Hans Stucki once cooked. Top Chef Tanja Grandits (17 Gault Millau Points, two Michelin Stars) and her husband René Graf Grandits took over Restaurant Stucki and immediately won guests and food critic’s hearts with their refreshing and caring hospitality. Atlantis: Klosterberg 1, modern décor and a fantastic rooftop terrace. Bar Rouge: Messeplatz 10, on the top floor of the Messetower and could not be more convenient to BaselWorld. Noohn: Henric Petri-Strasse 12, Euro-Asian menu as well as a-la-carte sushi bar and an ample bar with a diverse drink menu. Bar Campari: Steinenberg 7, During the summer it is a great spot to have a drink and be outside on the terrace with a great view of Tinguely Fountain. Ono: Leonhardsgraben 2, Chic interior and intimate place for dining or drinks. Baragraph: Kohlenberg 10, very mod and hip spot to spot in and enjoy a drink or two. Cargo Bar: St. Johanns Rheinweg 46, a hidden local favorite on the Rhine. When the weather is nice the crowd grows to enjoy the massive selection of unique drinks. Zum Kuss: Elisabethenstrasse 59, A great spot to have a drink before you catch your train out of town. If you grab a seat outside you can take in all the green around you and enjoy the heartbeat of the city at the same time or get cozy inside this intimate bar with candle light and communal seating.